Mermaid on the beach (photography by John Fox Photos). Have you ever laid in a bath wishing your legs would miraculously form together into a fish tail? Neither have I. I always dreamt of becoming a mermaid in swimming pools. Inside every woman – and maybe some men – there’s some unexplained fantasy in wanting more out of our legs, like let’s say, a glistening green tail. Teresa Beacham offers all a chance this June to make that dream a reality. This fundraiser of the summer invites a diverse group of Hastings mermaids and mermen to raise money for local charity, the RNLI (Hastings Lifeboat Station). Not to be confused with boozy Pirate Day or a pod of actual mermaids, Hastings’ Mermaids on the Beach creates an opportunity for us to give something back to our courageous volunteers. This rather mythical way of raising money was thought up by Teresa after she stumbled across a photo portraying women – seemingly mermaids – on Rock-A-Nore beach. After investigation, it was decided to organise the most creative, enjoyable and individual fundraising event Hastings beach has ever seen. The plan is to simply create a calendar full of photos from the day, to sell locally in order to support the RNLI. The RNLI is a lifeboat charity, which aims to save lives at sea. “Operating both all-weather and inshore lifeboats, Hastings lifeboat crews have been presented with over 30 awards for gallantry” – Hastings Lifeboat Station. 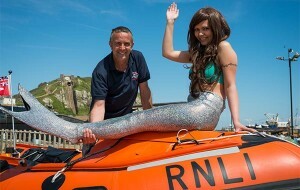 Mermaid in costume with the RNLI. Mermaids on the Beach is all about being experimental and letting loose your inner mermaid, or merman. The only request is that legs are to be covered in a mermaid like tail for the photo shoot. Tails can be made or purchased in a number of ways; eBay – where tails vary from £30-£100 – fancy dress stores, or even a basic pair of cut-up leggings stitched together to form a tail and fin. “The possibilities are endless,” said Teresa, “you can keep it simple.” There’s no need to panic though, you’re not being thrown in the deep end, this is a fundraising event, not a costumes contest so your tails can be as simple or outrageous as you like. A design workshop is being held at the Sea Angling Association, Hastings, on Sunday 15 June, for anyone wanting help or to share their ideas. For design ideas, visit the Mermaids on the Beach Facebook page. Press photographers Roz Bassford-South and John Fox have volunteered to be the professional photographers and shoot directors for the day. They will aim to capture one large group photo showing all merfolk taking part. All participants in the group shot must be wearing their tail. There will also be opportunities to have close-up shots taken afterwards. Every generous participant will receive an electric copy of the official mermaid print, and any requested portrait-style shots and smaller group photos will be taken and potentially used in the calendar. All the proceeds from sales of professional and donated photography will be given to the RNLI after the event. Calendars are predicted to sell at £10 each and will be available to order from the Mermaids on the Beach site. Charity collection buckets will also be available on the day if you wish to show your support, without sliding into something more slippery. £1 donation badges will also be on sale. The photo shoot is set to start between 1 and 2pm with the morning – from 11.30am – for preparation and last-minute registrations. This is a free event with no registration fee. Lifeguards and first aiders will be on hand, children are welcome – although those under 16 must be accompanied by an adult – and food and refreshments will be available to purchase nearby. Parking will be provided behind the West Marina Chalets, Cinque Ports Way, and toilets will also be accessible along the beach. For those wishing to carry larger bags, an attended ticketed cloakroom will be on set as bags and coats cannot be in the shoot. Changing rooms will be provided on the beach for those needing to change on the day. The annual Fish Festival will also be taking place the same weekend of the 21st, so maybe a salmon dinner with white wine to finish off the day? Thimbelina’s, located on Russell Street, is also offering a 10% discount to those purchasing material for Mermaids on the Beach. Materials can also be found at the Hastings Sewing Centre on Queens Road. The photo shoot will take place at West Marina Chalets, Cinque Ports Way, St. Leonards-on-Sea, TN38 0AJ. Having proudly taken part in the last 4 Pirate Days, I take strong objection to the term of “Boozy Pirate Day” used in this feature!